DEADWOOD BEAUTY: This home is listed with Bridget Gostola with The Real Estate Group at (605) 641-3894. Buyers check out this home it has been completely updated and move in ready! This home offers 4 bedrooms with 2 full bath with an open concept kitchen, dining and living room. Beautiful high end cabinets with wood flooring and vaulted ceilings, large master bedroom with huge closets. 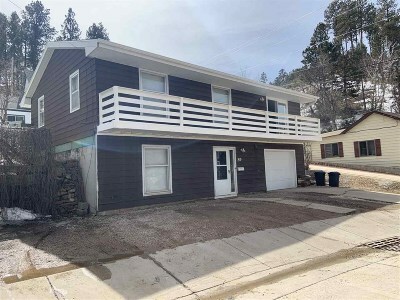 New Flooring throughout--new roof--new furnace/AC unit-- between the glass blinds on sliding doors--fenced in yard--deck overlooking Deadwood and private deck in back-corner lot--4 off street parking spaces plus garage. This GEM won&apos;t last long..call with any questions or to set up a showing.